A miniature pied duck with a very small black bill. Breeding male has green-black upperparts, white underparts with black cap and breast band and pale grey flanks. Striking white wingbars are visible in flight. Non-breeding plumage resembles the drabber, browner female (also shown) but retain the white wingbars. Habits: Feeds on aquatic vegetation and animals. Engages in aerobatic courtship chases. Ponds and tanks, preferably those covered with reeds and vegetation. Almost all India; not common, possibly absent over the arid NW regions. The smallest of India’s wildfowl, this is actually more closely related to a goose than a duck. It is also erroneously known as Cotton Teal. It is scarce and very local in our area and appears mainly to be a breeding summer visitor, with few records between November and March. It favours wetlands with floating aquatic vegetation (particularly water lilies) and moves around in pairs or small groups. Males indulge in noisy, cackling chases of the females prior to breeding and they will fly round and round the same area for many minutes. This noisy courtship gave rise to their old English name of Quacky Duck. When not flying, Cotton Pygmy-geese can be surprisingly inconspicuous for a pied bird. Careful scanning, however, will often reveal them swimming slowly through the vegetation pecking at leaves and the water’s surface and occasionally dipping their heads under water. They are extremely fast fliers but fortunately tend to stay rather low. They rarely mix with other wildfowl. 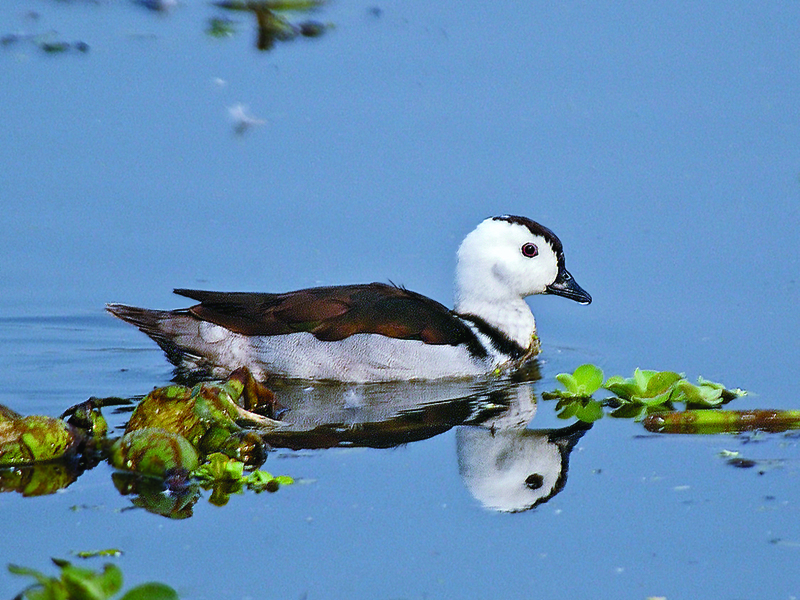 Cotton Pygmy-geese usually nest in holes in trees or even buildings and can often be seen perched on low tree branches. The young jump from the hole soon after hatching, protected from injuries by their light weight and thick down cover.